Question of the day: “What causes my gums to recede”? Several causes of gum recession have been identified, and here are the most common [not in any order]: Tooth grinding [bruxism in dental terminology] creates micromechanical tooth movement. This stress causes both gum recession and “notching” [abfractions] which are those notches that at the gumline of the teeth [this also has been studied to death and if you want me to send you the references, I will, just request them]. Brushing like a maniac [with a hard brush in a back and forth in a fast three inch motion–remember teeth are not floor tiles people]. Crooked [malposed] teeth have thinner bone over the top of them, and also thinner tissue on top of thinner bone [again, this is old clinical news], which makes the entire recession sequence easier. Finally, your family genetics–some people are born with a thinner gum structure [or biotype], which is more prone to recession. 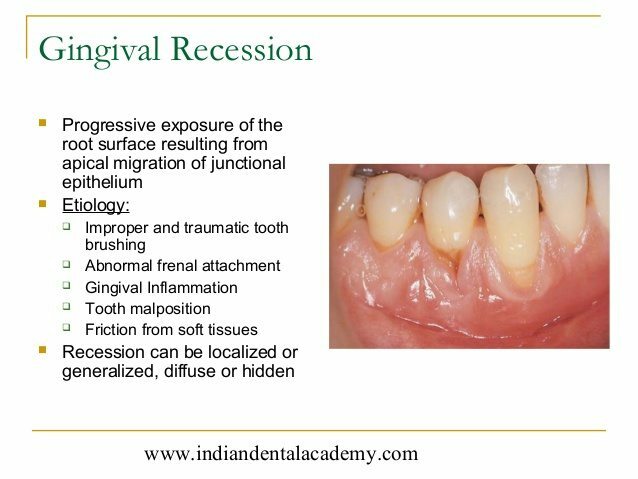 In addition frenums [or thin strong muscle attachments] can actually pull the gum attachments loose from you teeth, causing recession. This is one cause of gum recession where blaming your parents is at least partially correct.